Preferred stocks may appeal to investors looking for a robust income stream, but they come with heightened risks during a period of rising interest rates. If you’re considering or already own preferred shares, here are some points to keep in mind. Preferred stocks act more like bonds than common stock. They are generally issued at par value (for example, $25 or $100) and offer dividends at a fixed rate, similar to a bond coupon rate. Historically, preferred dividends have been higher than common stock dividends and bond yields (see graph). On the other hand, preferreds have little potential for price appreciation. The stocks are called “preferred” because dividends for preferred shares must be paid in full before dividends can be issued for common stock. (Bond interest is first in line.) The same order applies to recovering funds in a bankruptcy. Unlike common stock, preferreds do not offer corporate voting rights. Like bonds, preferreds are sensitive to changes in interest rates. But whereas bonds have a maturity date when the holder can expect to receive the bond principal (unless the issuer defaults), preferreds are issued in perpetuity. This can make them even more rate sensitive than bonds. When rates rise, the value of preferreds typically falls, because investors may be able to find higher yields in newly issued preferreds or bonds. Conversely, when rates fall, the value of preferreds may rise. However, most issuers reserve the right to “call” or buy back preferred shares after a certain date, so a company could call its preferred shares and issue new shares with a lower coupon rate. A call is less likely in a rising rate environment, which could make a buy-and-hold strategy more effective. Preferred stocks are not appropriate for all investors. Consider whether the higher yield from a preferred stock is worth the higher risk compared with a bond, or the lower appreciation potential compared with common stock. Keep in mind that bond interest is taxed as ordinary income, whereas preferred dividends may be taxed at lower qualified dividend and capital gains rates. Be sure to consult a tax professional for specific information. The amount of a company’s dividend can fluctuate with earnings, which are influenced by economic, market, and political events. Dividends are typically not guaranteed and could be changed or eliminated. 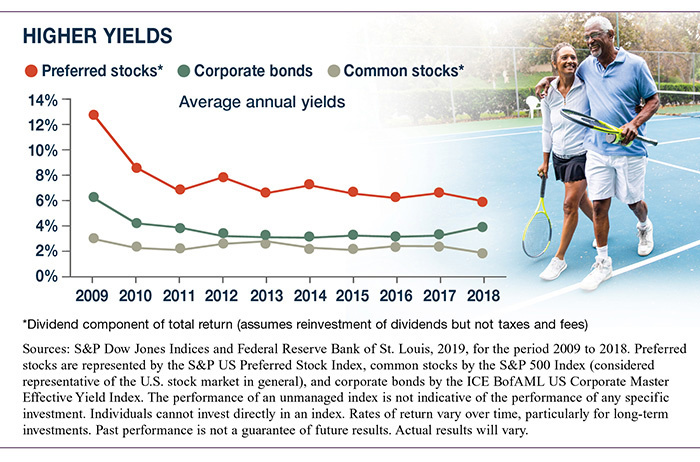 Investing in dividend-yielding equities is a long-term commitment, and investors should be prepared for periods in which dividend payers drag down, not boost, an equity portfolio. The return and principal value of all stocks fluctuate with changes in market conditions. Shares, when sold, and bonds redeemed prior to maturity may be worth more or less than their original cost. Insurance products offered through LPL Financial or its licensed affiliates. Cashmere Valley Bank and Cashmere Valley Wealth Management are not registered broker/dealers and are not affiliated with LPL Financial. The investment products sold through LPL Financial are not insured Cashmere Valley Bank deposits and are not FDIC insured. These products are not obligations of the Cashmere Valley Bank and are not endorsed, recommended or guaranteed by Cashmere Valley Bank or any government agency. The value of the investment may fluctuate, the return on the investment is not guaranteed, and loss of principal is possible.